As a child living in the central Victorian city of Bendigo, I loved to roam in the bush around Kangaroo Flat gathering wildflowers and going “speckin” for gold with my Dad. For several years I lived in Vancouver, Canada, where my two sons were born. Each winter I would look out my kitchen window towards the snow capped mountains that rose out of the bay, and at night could see the illuminated ski runs. On returning to Australia I lived at Heathmont at the foot of the beautiful Dandenong Ranges where birds of many different varieties would come to drink and splash in the fountain in our garden. I now live in a bayside suburb of Melbourne with my husband and even on cold and windy days enjoy walking along the beach with my White West Highland Terrier, Misty. After getting a degree in English Literature and General and Comparative Literature, from Monash University, I decided to study Professional and Creative Writing and Editing at RMIT. 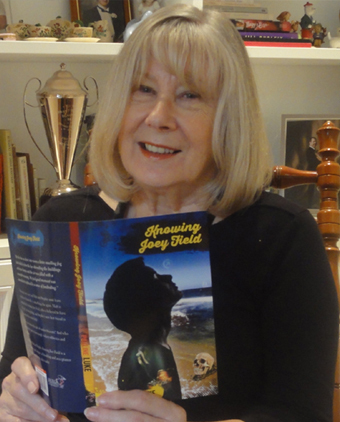 I have had a number of non fiction books published and my third novel for older readers, Knowing Joey Field, was recently released by Brolga Publishing. 2004 First YA novel, Amber Pash on Pink, published by the University of Queensland Press. for the best book for older readers by an Australian author. 2005 Awarded a three week Varuna Fellowship for an emerging writer. 2006 Awarded a two week May Gibbs Creative Time Residency at the Adelaide studio. 2007 Bronco Fi Maddie & Me, a book for older readers published by the University of Queensland Press and listed on the Victorian Premier’s Reading List. 2012/13 Appointed an Artist in Residence (Writer) by the Bayside City Council. 2013 Received a two week Creative Time Residency in the Adelaide studio of the May Gibbs Children’s Literature Trust. 2014 Knowing Joey Field, a book for older readers, published by Brolga publishing.